Her mother’s death hit Jean Vale Horemarsh hard. Really hard. It isn’t so much that Jean misses her mother. On the contrary, Marjorie was always fairly terrible to Jean, or at least not very nurturing and maternal. No, the hard part for Jean about her mother’s death is just how painful and degrading and difficult it was, no human being should have to go through that. It would have been so much better had Jean thought to spare her mother the pain and simply ended things early. Ah, well, it is too late now for Marjorie, but Jean and her acquaintances are aging rapidly these days, and just maybe she can spare her friends the same fate that consumed her mother. Ending their lives in a moment of happiness, before they become sick and infirm; what could be more practical? Practical Jean is a fascinatingly dark look at aging and the bonds of friendship. What is our obligation to the ones we love? What if those friends don’t have quite the same expectations of your friendship? Jean is an oddly sympathetic character. 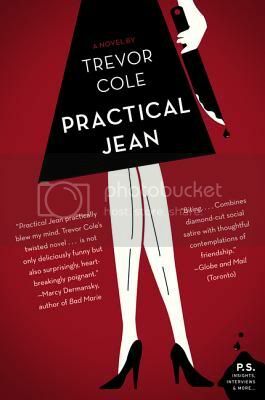 Clearly something in her snapped at her mother’s death for her to want to provide her friends with a moment of ultimate happiness and then kill them, but the way Cole develops Jean’s character and the story, she seems almost – but not quite – logical. One thing that Cole does really well in Practical Jean is give Jean’s friends enough depth to make them life-like, without making the reader truly attach to them so that the plotting of their deaths makes Jean seem monstrous. There is a bit of a slow start to Practical Jean, before Jean decides the best thing she could possibly do would be to kill all of her friends when the story just sort of meanders. Once she gets going, though the reader cannot help but turn the pages with morbid curiosity. Recommended. hm, on the one hand I am thinking I should pass, but on the other hand it sounds interesting… Hard call..
Oh, I REALLY want to read this. I was trying to get on the TLC tour for this but it’s just too darn popular! Glad you enjoyed it. Thanks for the warning about the slow start. I am excited for this one! Sounds odd, but in a good way. I’m interested in what Jean ends up doing “for” her friends. This does sound like an odd but compelling one! That’s a good description of this and many other Harper Perennial books! Interesting! I have this one, but haven’t started reading it yet. Thanks for sharing your thoughts! This looks so amazing! I can’t wait to get my hands on it! I’m just getting started on this one and I’m really enjoying the tone of the book.